Happy Hour at the Top Bar: Where do my bees go? When out and about town, I've developed a habit of looking for honeybees, and I can't help but wonder if they're mine. Or a gorgeous patch of forage will catch my eye and make me think of the girls at home. Can the bees reach these gorgeous flowers, I wonder? Also, whenever the bees are making queens, I can't help but wonder where the queen might go to find her suitors. According to Jay Smith, who tried an island for his mating yard, and he says the queens flew at least as far as two miles (3.2km). Some estimates I've seen are as much as four or five miles (6 to 8km). But I've also heard beekeepers who say they've seen matings (as evidenced by drone comets and the queen returning to the mating nuc) that occurred right in the beeyard. The problem is that I'm not good at knowing how far exactly 2 or 3 miles might be from my hives. In the past, I've used Google Maps and Google Earth to estimate how far my bees might travel, but as I recall, the process hasn't been perfect. Awhile ago, someone shared an awesome tool on FB that is even easier to use. It's a map tool that allows you to draw a radius around a point. As an instructional designer, my professional instincts cringe at the layout of the site and the instructions that are provided. However, once you figure it where everything is, it's quite simple. 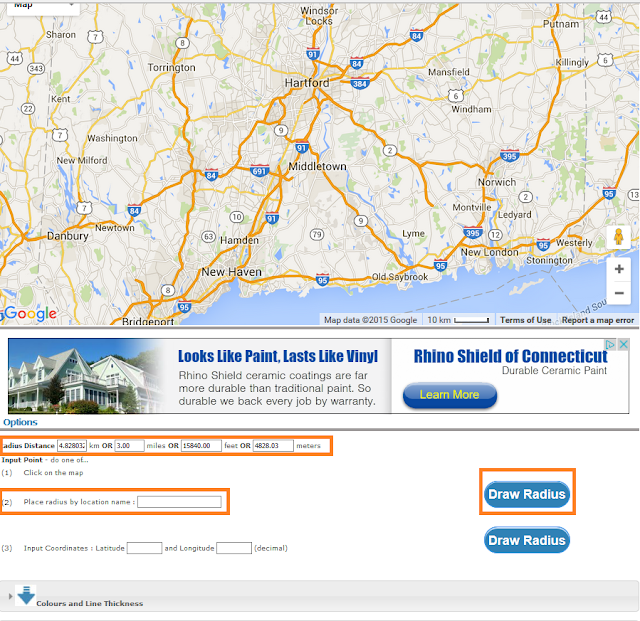 Scroll down past the map & ads to find a sections called Options. This is where you enter your data. Enter the address you want to use as the center point of your circle. Once the circle is drawn on your map, you can use the zoom tools (+/-) to hone in on your area. See what I mean? You really have to scroll way down before you can enter your info. One cool feature of this map tool is the Colours and Line Thickness editor, which is located just beneath the Options section. If you select the Colours and Line Thickness menu, it allows you to edit line thickness, line color, and fill color. This is a a neat option because you can draw several concentric circles all around the same point. For each circle, just change the radius distance (in the Options section) and the fill color before selecting Draw Radius. By drawing concentric circles, you can see what 1 mile, 2 miles, 3 miles, etc., looks like around your hives. I've found that it helps to put darker colors in the center of the "bulls-eye." You can also "create new colors" since the fills are transparent. E.g., you can overlay red on yellow and get an orange-ish color. The tool also allows for various output methods, including static map and Google Earth KML output. However, I didn't really try this since I could find all the info I wanted on the map in this tool. Anyway, this post is mostly for my benefit since I will no doubt continue to use it every now and then -- especially during the spring and summer when I see a nice stand of basswood trees or some lovely willows. However, if you're nutty like me, you might find it fun to see if a particular bit of forage is within flying distance of your hives, too. This is very cool. I've used a few similar apps on my smart phone, but it's much easier to do it with a keyboard and mouse on a regular computer. Under "URL to last radiusm," checking "URL loads full screen?" produces a link that displays the map to fill my full screen. Being able to drag the radius circle to a new location is handy too if you don't have an exact address.